In this brief report, we look at traditional methods of avoiding sink marks as well as design choices engineers can make to mask sink marks when they are unavoidable. The value of injection-molded parts depends in large part on how they look, regardless of functionality. Unfortunately, aesthetic defects can be caused by even small deviations from guidelines for mold and part design. Predicting when defects will occur can be difficult, and sink marks offer a particularly frustrating challenge. A sink mark is a surface depression that usually occurs in thicker sections of the part or in locations directly above ribs, bosses, and internal fillets. 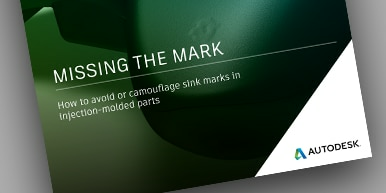 Sink marks are caused by localized shrinkage of the material during cooling whenever there is insufficient compensation. This report explains how and why sink marks occur and how to use traditional compensation methods to avoid them. It also explores research in visual perception to show how simple choices in color and texture and help mask the appearance of sink marks in applications when they are unavoidable.